Like A River Glorious (Perfect Peace) Check Here For Updates! Swift and “beautiful” for Thee. 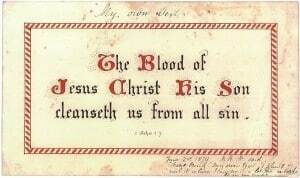 Written February 4, 1874, Frances and also others called this the consecration hymn. and long prayed for, some converted but not rejoicing Christians. words. Sankey’s arrangement “a mournful ditty,” grieved her. 1 Frances Ridley Havergal: Worcestershire Hymnwriter by Janet Grierson (Bromsgrove, Worcestershire: The Havergal Society, 1979), original book pages 147-148, page 1200 of Volume IV of the Havergal edition. 2 Memorials of Frances Ridley Havergal by her sister Maria Vernon Graham (London: James Nisbet & Co., 1880), original book pages 132-133, page 37 of Volume IV of the Havergal edition. 3 This is found in the “Memorandum by M.V.G.H.” in Letters by the Late Frances Ridley Havergal edited by her sister Maria Vernon Graham Havergal (London: James Nisbet & Co., 1886), original book pages 326-328, pages 236-237 of Volume IV of the Havergal edition. 4 Letters by the Late Frances Ridley Havergal, original book page 311, page 234 of Volume IV of the Havergal edition.